This month marks the 61st anniversary of the landmark U.S. Supreme Court decision regarding one of the earliest gay publications in America, ONE: The Homosexual Magazine. The U.S. postal service had attempted to ban the magazine as “obscene,” and the one-sentence 1958 Supreme Court ruling in the magazine’s favor marked the first time gay rights ever won in the highest U.S. court. It all started back in January 1953 when ONE — a magazine published by an offshoot of the early gay men’s organization, The Mattachine Society — published its first issue. It sold for 25 cents in gay bars (about the price of a beer) and had articles like “Homosexual Rights,” “Are Homosexuals Neurotic?,” and “A Tribute to Dr. Kinsey,” according to gay historian Matt Baume. So any magazine about gay men was, in essence, encouraging criminal activity. No matchmaking ads; no racy photos; no descriptions of physical intimacy—even cuddling. But the following year, an issue contained ads for sheer pajamas and a short story that involved some touching, which led the Post Office to seize the issue. When the Los Angeles post office seized issues of the magazine, refusing to mail them, civil rights attorney Eric Julber sued the Los Angeles Postmaster Otto Olesen. Julber believed Olesen’s refusal to mail ONE violated U.S. constitutional guarantees to free speech and equal protection under the law. The case was so contentious that not even the Los Angeles ACLU wanted to touch it. As evidence of obscenity, he cited one piece of fiction in which a woman recalls an affair with her college roommate and decides to live with the woman rather than marry a high school boyfriend. Julber also lost at the 9th Circuit Court of Appeals in February 1957. 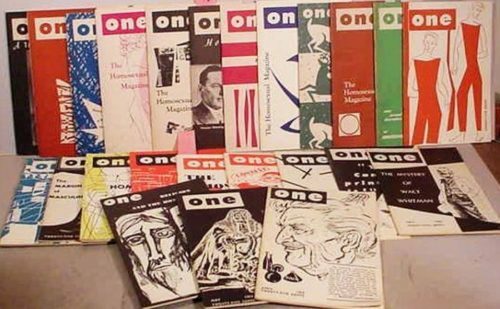 ONE magazine nearly went defunct since it was unable to reach its over 2,000 subscribers. But Julber’s eventual 1958 victory at the U.S. Supreme Court was helped by the fact that several lower courts had allowed the publication of literature advocating nudism and polygamy. Seemingly, the courts were now discriminating against ONE just for writing about homosexuality. Because of its brief response, the court’s brevity did nothing to prevent similar “obscenity” lawsuits against other queer-created works of literature like Allen Ginsburg’s 1956 poem Howl and William S. Burroughs’ 1959 novel Naked Lunch. The ruling also paved the way for physique pictorial magazines that were among the earliest examples of mass produced gay photo erotica.